Donald Trump is a serial exploiter of prejudice. Cross him and your ethnicity is grounds for suspicion. 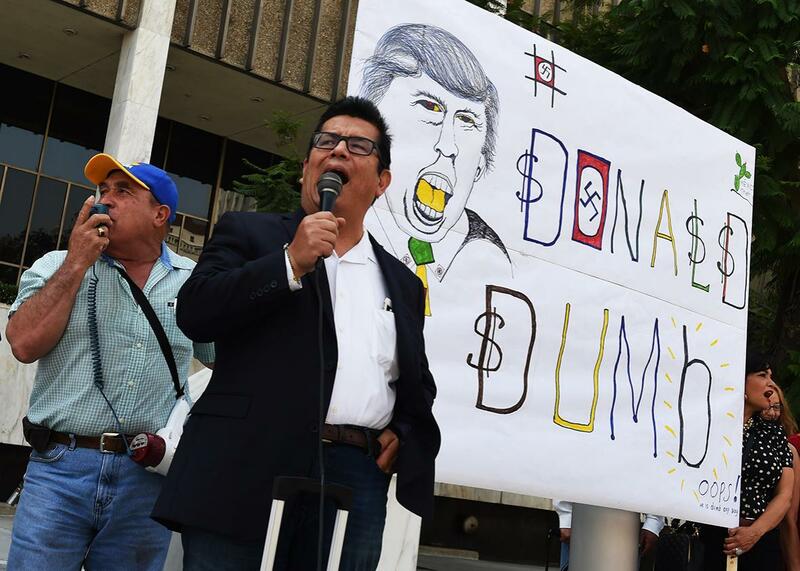 A man leads a coalition of Latino community leaders in a protest against Donald Trump in Los Angeles on Aug. 19, 2015. From this interview and other statements during the campaign, we have a clear portrait of Trump’s thinking about minorities. It extends beyond Latinos to blacks, Muslims, and other groups. Trump isn’t an incorrigible bigot. He’s an incorrigible user of bigotry. This is no longer deniable. Republican leaders who support Trump—Republican National Committee Chairman Reince Priebus, Senate Majority Leader Mitch McConnell, and House Speaker Paul Ryan—should explain why they accept this conduct in their presidential nominee. In December, Trump issued a statement calling for a “complete shutdown of Muslims entering the United States.” Ryan, McConnell, and Priebus disagreed. But Trump stood by his demand, and in the past few weeks, all three men have endorsed him. Barring people from the United States based on religion does not disqualify you from the support of the GOP leadership. Ryan, McConnell, and Priebus pretended that the Muslim ban was an aberration. But in the past year, it has become clear that Trump takes the same view of Latinos. He doesn’t hate all of them. He’s happy to say he loves them and pose with a taco bowl on Cinco de Mayo. He turns on them only if they get in his way. If you run against Trump, or if you refuse to dismiss a fraud suit against him, Trump will use your ethnicity against you. He will tell white people that you’re not to be trusted, because you’re Latino. Trump has now done this six times. He said that Jeb Bush “has to like the Mexican illegals because of his wife,” because she’s “from Mexico.” He warned Iowans not to vote for Sen. Ted Cruz because “not a lot of evangelicals come out of Cuba.” Two weeks later, Trump made an almost identical statement about people of Cuban descent. 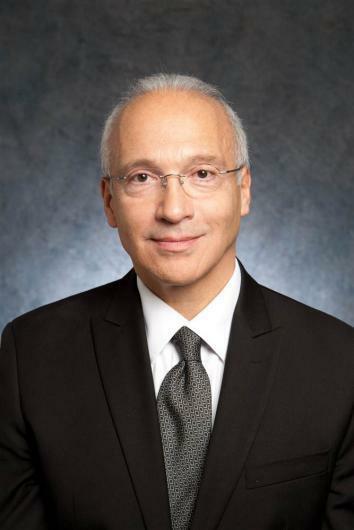 He said Curiel was conspiring against him because “I’m very, very strong on the border” and Curiel is “Spanish.” A week ago, Trump said Curiel was biased and “Mexican.” Trump’s spokeswoman explained how the judge’s ethnicity and his alleged bias were supposedly connected. Trump’s apologists in the conservative media have tried to dress up his beef with the judge as a complaint about illegal immigrants or membership in a political organization. But in his interview with the Journal, Trump tossed that cloak aside. If you’re “of Mexican heritage,” says Trump, you have “an inherent conflict of interest” in judging him. It doesn’t matter which organizations you join or whom you give scholarships to. Your ethnicity is prima facie grounds for suspicion. Trump will try to clean up this incident, as he has after previous slurs, by saying he employs Hispanics, has Muslim friends, sells apartments to Asians, or has “a great relationship with the blacks.” But what makes him unfit for the presidency isn’t that he hates everyone of a particular race, ethnicity, or religion. It’s that he has no compunction about using race, ethnicity, or religion for advantage. If you rule his way, he’ll be pals and share a taco bowl. If you don’t, he’ll go after your heritage. This is the man Ryan, McConnell, Priebus, and other Republicans have endorsed for president. Banning Muslims, smearing Latinos, blaming blacks, mocking disabilities—none of it is disqualifying in today’s GOP. Days after Trump and his spokeswoman denounced the “Mexican” judge, Ryan endorsed him anyway. The speaker said of Trump: “On the issues that make up our agenda, we have more common ground than disagreement.” If you belong to a minority—any minority—that tells you all you need to know.